Our Term 2 for 2019 runs from Monday April 29 to Friday June 28 2019. The Term 2, 2019 Schedule of Courses, one comprehensive guide to our term courses & activities and one detailed guide to our full year courses. 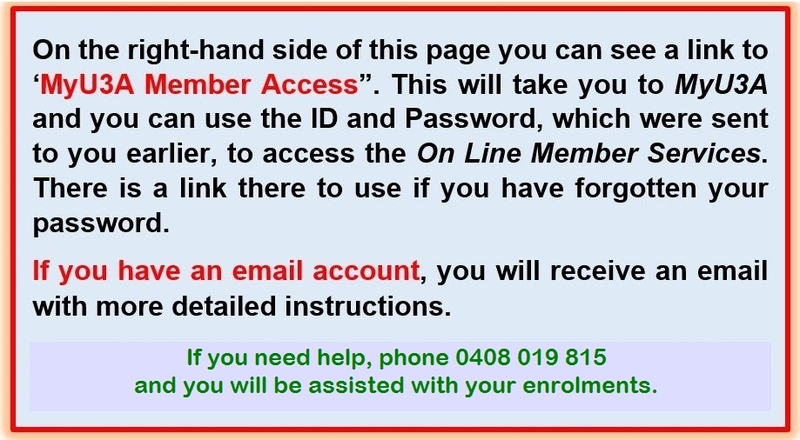 The instructions for online enrolment for all courses & activities. To enrol online for Full Year Courses, Short Courses, Technology Courses, News & Views and Visits & Outings, download and read the instruction document, then follow the procedure detailed in the box below, or simply click on it, to be taken to the MyU3A login page. Please enroll for Term 2 classes as soon as possible to facilitate the compilation of Class Lists.